It can be pretty stressful eating out with a baby. You want to be sure they are content because you DON’T want to be that mom who has a fussy baby/toddler. If you want to give your little one some independence so you hear less fuss and can actually eat your meal check out these great products from Nuby and b.box. I’m sharing with you my favorite products to bring out to eat. First of all you need a good bib. b.box makes a wonderful travel bib that rolls up and zips into a pouch so no matter how yucky it gets all that yuck will be zipped up. Now you just saved that diaper bag from being contaminated. It also comes with a nifty and super flexible silicone spoon which can also be zipped up into the bib. I just love that here is a cute little pouch at the bottom of the bib which catches any dropped food & then doubles as a place to roll up the bib. If your little one is starting to try out silverware you will need a beginner set that travels and stays clean until use and doesn’t dirty the diaper bag once used. b.box has a wonderful toddler cutlery set with a spoon and fork. The fork looks a big silly, but it’s acutely easier for your little to practice stabbing food with this than the typical fork. The spoon is perfectly shaped for scooping as well. Now you are thinking, okay, well where is the eating space? I got you! 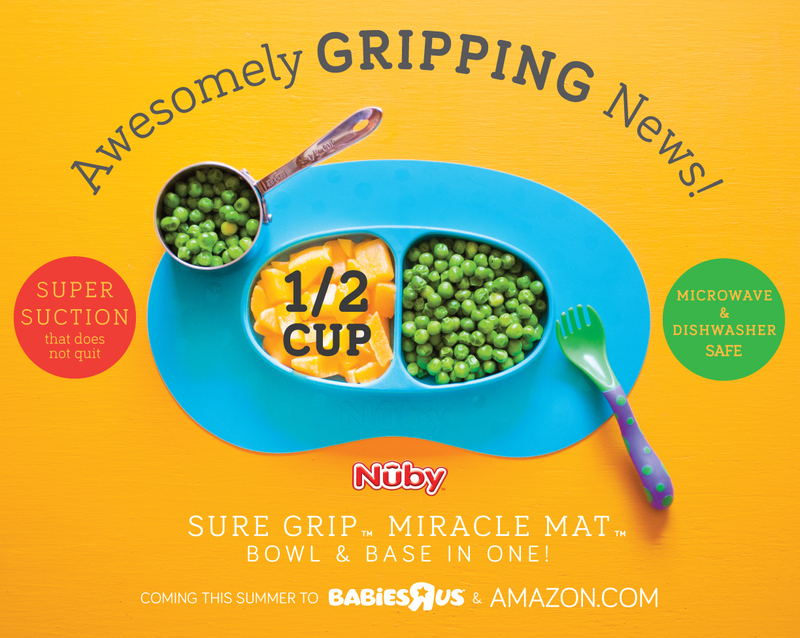 Nuby has an amazing new product coming this July to Babies R Us and Amazon for your little one to eat off of. 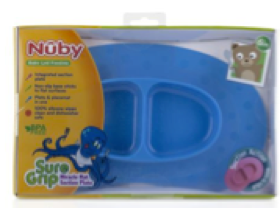 The NubyTM Sure gripTM Miracle Mat is made of 100% BPA free silicone with super gripping action! The built in suction grip easily seals to tabletops and highchairs keeping it firmly in one place! It’s also easy to wipe off and the perfect size to slip in the diaper bag for meals out. Thirsty thinking about all of this eating, Nuby also has you covered with a travel cup. I love the Nuby Busy Sipper, 2 Stage Cup because it transitions between a sippy and pop up top. Perfect for your babe because we all know they grow up way top fast. What else to love about this sippy, well it’s soft silicone spout is no spill. I also love the hygenic travel cover and the fact it has a clip which allows it to stay hooked on to the Nuby Keepeez strap. Bonus about the cup, it’s BPA free and comes apart & cleans easily. The Keepeez strap is a must for keeping the cup off the floor so pick one of those up too! This is the easiest cup catcher I’ve ever used and we have tried quite a few. I promise you will love it and end up using it for way more than in a restaurant. I hope you are feeling ready to venture out to a restaurant with your new gear! Your little one will be so excited to try all out of these products as well. Don’t forget to check back here and on Instagram for a NubyTM Sure gripTM Miracle Mat GIVEAWAY! The giveaway will be soon! Try out this mat before its release in July! We use something similar to the cup strap and it’s a total lifesaver! I can’t wait to get my hands on that mat, though! It looks amazing! The mat is so awesome! Such a great size for travel! I need that keeper strap! My baby throws his sippy ALL OVER the restaurant! It’s amazing! The best one I’ve ever tried! Such great tips, thank you for sharing! Love this!!! That bib is bomb!!! This is an awesome roundup! These products are MUSTS! All of these seem like amazing products! !